The top section of the Filters window provides an option to exclude all samples of a particular value when found at the top or bottom of traces. Samples in the middle of traces are not affected. By default, the value for this filter is set to "0". This is especially useful in the 3D View, where these unwanted samples can obscure other data. By default, this setting is enabled. 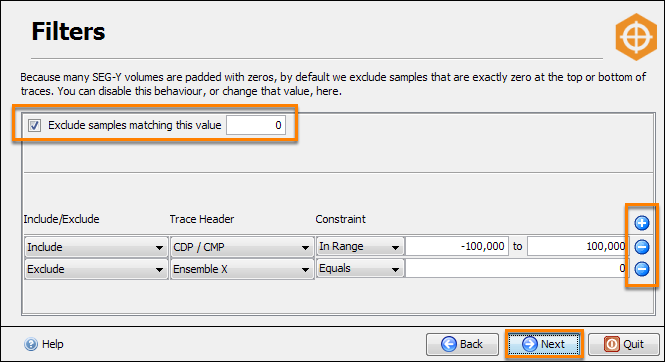 However, you can disable it by clearing the Exclude samples matching this value check box or change the filtered value. Additionally, you can also filter the data based on various trace headers. You can set the filter to include or exclude certain data. Multiple filters can be applied and a logical AND operation is used to combine these. That is, a trace must pass through all the filters to be included.